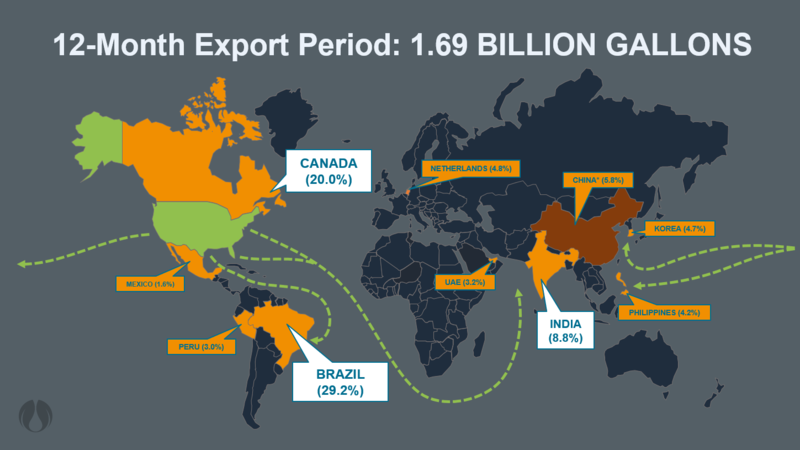 For the third time this year, American ethanol exports have reached record numbers on a rolling 12-month basis, with the 12-month total climbing to an astounding 1.69 billion gallons (bg) of ethanol exports. Exports have now reached 1.41 bg for 2018 year-to-date and American ethanol exports have now exceeded exports for all of 2017 combined, with an additional two months still yet to report. Among the top export destinations, we saw an expected resurgence from the Brazilian market, who topped the charts with nearly 55 million gallons (mg) of ethanol for the month of October, bringing their total imports of American ethanol to 424.5 mg for the year. This large jump can be attributed to two primary factors. The first is the end of their sugarcane harvest, meaning that the country has turned to imports to meet their ethanol demand. The second is the changing nature of ethanol demand in the country, which has seen a growing blend rate due to the increasing popularity and sales of hydrous ethanol, which has seen record sales number this year. These two factors mean that we can expect to continue seeing strong export numbers to Brazil through the end of the year and going into early 2019. Canada also had another solid month coming in at just over 30 mg, the sixth month in a row they have done so. Canada continues to be a consistent market for ethanol exports with a year-to-date total of 292.6 mg. However, we may see those numbers rise in the coming years. The Province of Ontario recently announced in their Environmental Plan their intent to move to a 15 percent ethanol-blended fuel mandate by 2025, a decision that further expands on the country’s push for a nationwide E10 blend. This move was welcomed by Growth Energy and is also representative of the latest in a long line of new biofuels commitments by countries around the globe. Developments such as Canada’s commitment to higher blends of ethanol and the growing popularity of ethanol in Brazil should give optimism for the future of the global ethanol outlook in the coming years. We have seen countries across the globe doubling down on the cleaner, more affordable fuel alternative. In the United states, President Trump recently signaled there could be a possible resolution to the current trade tensions with China soon, meaning a market for potentially hundreds of millions of gallons could reopen to American producers, which closed in March of this year. These examples are a few in a long line of countries from around the world who are committing to ethanol as a way to improve their environmental and economic outlooks and to improve their energy security. As I have discussed in the past, countries like India, Vietnam, Brazil, and even the United States have all been expanding on their commitments to ethanol blended fuel. One aspect that will be critical for American ethanol producers and exporters, is ensuring that barriers to trade are reduced between the U.S. and its global trading partners. Stay tuned for more this month on some of the recent developments in the global ethanol outlook for 2018 and looking ahead to 2019. For more information, please contact Senior Vice President of Global Markets, Craig Willis, and follow him on his LinkedIn here.